The Form Fit Neoprene Knee Sleeve features a unique accordion design that enhances comfort around the knee. The The open or closed patella design provides support and comfort as required. It stays in place better and the unique design in the rear reduces slippage down the leg. 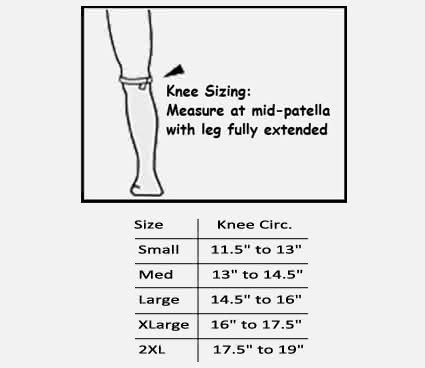 The FormFit neoprene knee sleeve comes in an open or closed patella design, with a donut or U-shaped buttress, and is available in 1/8” or 1/4” neoprene. It's well suited for providing mild support and compression for knee strains, arthritis, and injuries requiring light protection. The Form Fit neoprene knee sleeve provides effective support, mild compression, and mild patella support at an economical price. Unique accordion design enhances comfort. Available in 1/8" or 1/4" neoprene. Seamless behind the knee for comfort. Available in four different versions: Patella Cutout (hole in the front for the kneecap), Closed Patella with the material left in front over the kneecap, with Donut Buttress or with U-Shaped Buttress for added patella control. Comfortable for daily wear and mild athletic use. Available in five sizes to fit every size knee. After coming up empty locally, I called DME-Direct late on a Friday afternoon in search of a knee sleeve for my daughter because she needed it for a track meet on Monday. We'd bought the same product at a med/surgical supply store a half an hour away and it shredded around the opening the first day she wore it, offering no support. It was their only small and we needed to return it so they could send it back to Ossur and get a replacement, which would have come in after her meet. I searched online and found DME-Direct. I was shocked when a live person answered the phone! She couldn't have been more helpful in expediting the shipment. It arrived Monday in time for me to bring it to the meet. The only reason I'm giving the product a 4 instead of a 5 is it runs a little big but it's the only knee sleeve that even comes close to fitting my daughter. The neoprene knee brace I purchased gives me firm support with great mobility. Great product that I will re-order down the road. Q: How long is this from top to bottom? A: It measures roughly 13-13.5" in length depending on the size ordered.